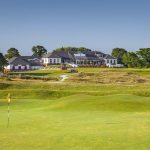 The 73rd International Golf Championship of the Shoe, Leather and Allied Trades was played over the Hillside and Southport over three days at the end of June. The sun shone throughout the three days but a challenging wind and the large number of bunkers made low scoring difficult with both courses presenting a real challenge to the 91 golfers. It was great to see so many familar faces at the banquet where more than £ 8,000 was raised from a very successful Derby Draw, Raffle and Auction with thanks due to Ivor Tilley for organising the auction items and Ian Ferris for obtaining the many excellent raffle prizes. Over the 73 years the event has been held more than £ 500,000 has been donated to the two main trade charities, Footwear Friends and LHTBI, the leather industry charity, who thank the Committee, Sponsors and all the players for their generous support. The 2019 Championship will be held at Carden Park in Cheshire from June 12th to 14th. Finally a big thank you to the secretary of the Championship Committee, Rodney Gibson, who works tirelessly to ensure the success of this enjoyable event.